The Cubs have the Mets right where they want them. Let’s take a little trip down memory lane, back to 2004. On this date, the Boston Red Sox were preparing for their World Series showdown with the St. Louis Cardinals after having completed the first comeback of its kind in MLB history the night before: a 3-0 deficit in a best-of-seven postseason series turned in to a 4-3 series win. And, technically, that memorable game 7 had ended juuuuust after midnight on October 21 (bbref lists a start time of 8:30 and a duration of 3:31, putting the deciding game’s end at 12:01 AM). Back to the present. Surely, you say, the Red Sox’ improbable run in 2004 has absolutely nothing to do with this year’s iteration of the Chicago Cubs. Not so fast. Obviously, both franchises have/had extraordinarily lost championship droughts. The Red Sox were staring 86 seasons in the face; they last won it all in 1918, two seasons before their owner sold none other than Babe Ruth to their hated rivals, the New York Yankees. The Cubs, meanwhile, have been trophy-free since 1908, and haven’t even appeared in a World Series since 1945, the same year the owner of the local Billy Goat Tavern jinxed the Cubs after he and his pet goat were asked to leave a World Series game against the Detroit Tigers. Both teams finished with win totals in the upper 90s (Cubs: 97; Red Sox: 98) and finished precisely 3 games behind their main rival and division champion (Cardinals: 100-62; Yankees: 101-61), thereby relegating the beleaguered club to the Wild Card (or, in Chicago’s case, the 2nd Wild Card and a one-game playoff). Both teams defeated the Cardinals in four games in their respective postseasons–the Red Sox, of course, in the World Series and the Cubbies in the NLDS. Both teams squared off against their respective league’s New York franchise in the LCS and dug themselves an 0-3 hole against said club. And, really, that’s approximately where the eerie similarities end. I was hoping, prior to researching this topic, that the Red Sox had beaten the A’s in the ALDS that in ’04, because then I could draw a connection between a former location from that franchise (Kansas City) and the American League’s likely World Series representative this season (Royals). But it wasn’t to be. The 2004 A’s finished a game behind the Anaheim Angels, whom the Red Sox swept out of the postseason in the ALDS. Unfortunately, there were no players from that team who played for this year’s Royals or Toronto Blue Jays. It would be far too easy to complete a “six degrees of a 2004 Anaheim Angel” with either of this year’s ALCS participants. After all, a few players suited up for KC and Torotno as recently as two or three seasons ago. But only four ’04 Angels were still active in 2015, most notably Bartolo Colon for the Mets and John Lackey for St. Louis. Different managers, too. I mean, Ned Yost and John Gibbons both played in the majors around the same time as Angels manager Mike Scioscia, who was far and away the most successful of the trio of catchers. Gibbons did catch a handful of games for the ’86 Mets, who prolonged Boston’s misery in that year’s World Series. But I’ve otherwise given up on trying to connect the 2004 Angels to the 2015 Royals and Blue Jays, geographically, personnel-wise, etc. Then there’s Theo Epstein and Manny Ramirez. Epstein was the architect of Boston’s nearly-unprecedented postseason success as the general manager; he has also seemingly resurrected the Cubs in just a few short seasons. Manny, of course, was a key figure in Boston’s postseason success. Presently, he serves as a hitting consultant in the Cubs’ organization. So there’s that. Back to the future. Either way, there will be an interesting narrative to write tonight. 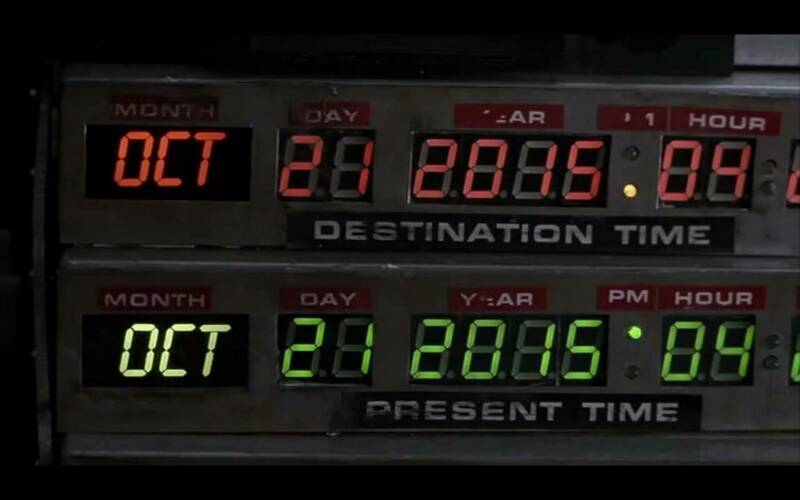 Either the Mets will sweep the Cubs out of the 2015 postseason on the date to which Doc Brown and Marty McFly traveled in Back to the Future Part II, in which Marty initially conceives of his sports betting scheme after seeing the breaking news that the long-shot Cubbies won the World Series. Or they’ll begin their epic turnaround tonight and surge to their first World Series title in 108 years, just as Robert Zemeckis and Bob Gale foretold some 26 years ago.